A 5-month-old baby is set to become the youngest member of the All Fifty States Club, and her parents hope its only the start of a life full of "confidence and curiosity." 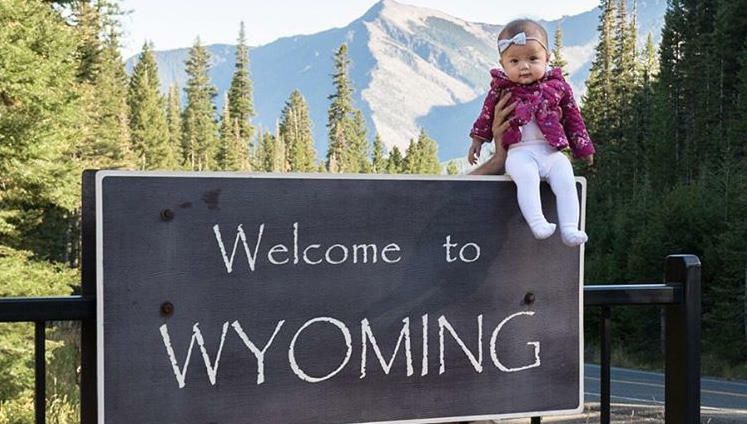 Little Harper Yeats has been traveling with mother Cindy Lim and father Tristan Yeats, who have been documenting their ambitious tour of the United States on Instagram over the last four months. "We always wanted to visit all 50 states," Cindy Lim told CBS News on Wednesday. The couple was on maternity leave after Harper was born and they set their sights on another U.S. trip –– except they didn't plan on seeing all of it with their newborn right away. They started the trip by entering Maine in June and it wasn't until they looked into an All Fifty States Club membership –– and the possibility of Harper becoming the freshest face in group –– that the idea caught traction. "Why not go to all 50 states?" Cindy said. "It was just our plan to do it together and have fun." They've nearly completed their journey, having visited more than 40 states and counting. On social media, dozens of pictures feature Harper being held, and often smiling, in front of state signage or popular tourist attractions. "She wakes up every morning happy and smiling," Cindy said. "I like to think its impacting who she will become." "Personally, when she looks back and what we achieved, I hope when she looks at the photos and I tell her all the stories, that she can have the confidence that she can do anything," Cindy said.